Nov 25, 2011 – The following is a transcript of a recent speech given by Professor William Black on an Economics Panel regarding the fradulent roots of our current crisis and the urgent … If you look at just losses in the household sector, it is $11 trillion. …. William Black: Why No One Went to Jail During the Credit Crisis. The King of Arizona, Couch Mortgage, Lee Farkas and the WESTERN NATIONAL BANKS and Thousands of Others PLAY the HOCUS GAMES ….. 700 Trillion TAYLOR BEAN AND WHITAKER / FARCAS – DEAN COUCH – KENNY BOY – ABRAMOFF – MADOFF Games. Former Houston US Secret Service Agent Rick Williams currently works as Chief of Security at Connoco Phillips Oil in the Woodlands. As You know Judge Hughes the Octopus Operations all over Harris and Montgomery County has left a HUGE and SMELLY Trail of Iran Contra and Charlie Wilson’s War all over Texas. Huge numbers of Witnesses and Media including Roland Carnaby’s Family and Secretary of State James Baker with JoAnna King and the Iran Contra BLACK BAGGERS of Big “H” and Little “W” Bush and the Mena Clinton Mobsters used Houston as Their Private BORDELLO with the most famous Weapons Traffickers in American History. Clark Clifford and Roger Altman and Oliver North and the Admiral Secord, Casey, Poindexter CARTEL OF BLACK BAG OPERATIONS were something ROLAND CARNABY Et Al and JoAnna’s Crowd with Secretary of State Jame’s Baker, THE HOUSTON POST and HOUSTON CHRONICLE just could NOT keep SECRET. The Records of the Houston Federal Court reveals I WAS TARGETED and LIED ABOUT hugely by FORMER Houston FBI GOON ….. Agent John Connolly of the Whitey Bulger / Winter Hill Gang Flavor. The FBI Goof Ball that ACCUSED ME on November 18th 1985 is Serving Life In Prison for Many Murders and Money Scams He was involved in. SEEMS Operation Lonestar went ROGUE and WILD after the Sharpstown …. Rent A Bank Scandals …… EXPLODING into the Banking and S&L Schemes of the 1970s and 1980s and 1990s ….. YOU KNOW Todays Missing Vanished TRILLIONS. This is a Letter I sent to the Houston Chronicle Today. A FRIEND HAS ASKED THAT I HAVE MY ARREST RECORD EXPUNGED REGARDING The BLANKET PARTY HOUSTON FBI Tried to Throw for Me in 1985. In closing Judge Hughes ….. Magistrate Lingo Platter knew very well as does FORMER US SECRET SERVICE AGENT RICK WILLIAMS ….. Many Trillions Seem to Have VANISHED …… Harris County Style. I’d like to have My FBI / SECRET SERVICE Arrest EXPUNGED. So lets see ….. IRAN CONTRA, The Clintons , Oliver North and Secord, Bin Ladins and what Charlie Wilson, Roland Carnaby and the Poidexter, Casey Crew with JoAnna want to COLONIZE Afghanistan. Hmmmmmm Interesting Stuff. Dec 13, 2017 – Photograph of Congressman Charles Wilson laughing with First Lady Barbara Bush, President George H.W. Bush, and Texas Governor Ann Richards. Oct 31, 2008 – BCCI consisted of layers of interlocking corporate entities, which enabled it to decentralize record keeping, avoid banking regulations, and evade a complete ….. the Saudis had taken a stake with the 1978 purchase of the bank’ headquarters building by members of the Bin–Laden and bin-Mahfouz families. Jun 9, 2008 – From BCCI, to Milken’s Junk Bond Kings, to Jack Abramoff, Senator John McCain has long provided the clean All-American face to the dirty job of … in which the Saudis had taken a stake with the 1978 purchase of the bank’ headquarters building by members of the Bin–Laden and bin-Mahfouz families. Aug 15, 1993 – Robert A. Altman, a Washington lawyer charged with trying to defraud regulators about the secret acquisition of First American Bankshares Inc. by the Bank of Credit … The acquittal was vindication for Mr. Altman, who was indicted in July 1992 along with Clark M. Clifford, his mentor and former law partner. Apr 11, 1993 – Maneuverings in the courts of New York and Washington have lowered the chances for a satisfying judgment about Clark Clifford, the erstwhile … That leaves his law partner, Robert Altman, to plead that both men were deceived about B.C.C.I.‘s illegal foreign control of the American bank they chaired. Clifford & Warnke 815 Connecticut Avenue, NW Washington, D.C. 20006 Dear Mr. Altman: The purpose of this letter is to outline areas where we feel we can be of assistance to you and your clients, the Bank of Credit and Commerce International (Overseas) Ltd. and Che Bank of Credit and Commerce, S.A. (“BCCI“). BCCI accounts.”9 When BCCI collapsed in July 1991, it was hopelessly insolvent, and thousands of small depositors were bereft of their life savings. The damages caused by ….. dents.62 Clifford and his associate, Robert Altman, provided lucrative ….. Williams lived in a “palatial Gwanda Bay manor,” drove a Rolls Royce,. Main article: Bank of Credit and Commerce International, Clark M. Clifford. Federal Reserve: A Faustian Bargain? The recently declassified 28-pages of the 9/11 report are undergoing a lot of examination. 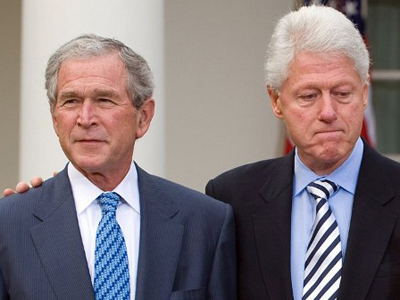 As a result, Ryan Mauro at ClarionProject.org is convinced that both Presidents George W. Bush and Bill Clinton are implicated in Saudi Arabia’s Involvement in terrorism in the united States. The censoring of the documents leaves us to wonder what specific terror-related presence the documents are referring to, but it is very clear that it is a network linked to the Saudi government and insufficient investigative resources were allotted for it because of those linkages. The Bush Administration was in office for only 9 months, but cannot be absolved of blame. The files do not indicate that any change in direction was ordered before the attacks and it chose to classify the pages exposing the Saudis in the 2002 report. The Bush Administration also opted not to blacklist two terror-tied organizations with strong Saudi ties: Muslim World League and International Islamic Relief Organization. The former also has strong links to Huma Abedin and her family, one of the closest advisers to Hillary Clinton. He also reminds us that Prince Bandar’s wife paid $74,000 for “nursing services” to the wife of a Saudi intelligence officer who has been linked to the 9/11 hijackers. Copies of the checks, which dated from February 1999 to May 2002 have been found by the FBI, but they say such services were never rendered. The Bushes are not the only ones to blame in this matter. Bill Clinton had two terms to deal with the Saudis and their connections to terrorism, but failed to do so. These revelations should be brought to the forefront in the current presidential race since it is Clinton’s wife who is now running for office when she should be summarily indicted, tried, found guilty and hanged for treason, along with her husband and a plethora government accomplices in both the House and Senate. The Foreign Agents Registration Act is led by a major Democratic Party financier, the brother of Hillary Clinton’s presidential campaign manager. This terror-tied organization receives $140,00 per month by the Saudis. The website indicates that 14 active foreign agents of Saudi Arabia are listed. The question should then arise, why do we not only allow such spineless and weak men to represent us, but also, why we have any relations at all with Saudi Arabia? As a final question, I ask, why have we not gone to war with the Saudis over their involvement in 9/11? Nov 4, 2016 – Wealthy officials from Qatar and Saudi Arabia who donated money to Hillary Clinton’scharitable foundation also provided financial support to Isis, WikiLeaks founder Julian Assange has claimed. Back in the 1980s I undertook efforts to EXPOSE gargantuan S&L and Bank Lootings in Texas and across the United States, That effort ULTIMATELY Prevailed and the S&L / Banking Debacle was exposed. Subsequently VAST SUMS of Money has as well been looted in a LARGE series of Other Scams and Schemes costing US Taxpayers TRILLIONS. When I began My Whistle Blowing in Houston UNBEKNOWNST To Me large scale BLACK OPERATIONS were ongoing out of 515 and the Houstonian Residence of Vice President george Bush to SECRETLY Finance and Move very large amounts of Weapons all over the World. Today I believe Hillary and Bill Clinton and the Obama State department have once again engaged in such activities. In the 1980s I was FALSELY ARRESTED using an INFORMATION COMPLAINT that Former US FBI AGENT JOHN CONNOLLY orchestrated. Former FBI Agent Connolly is serving LIFE IN PRISON for the Crimes He engaged in with Whitey Bulger and the Winter Hill Gang. I was NEVER INDICTED and NEVER TRIED and Never was any Jury Verdict of NOT Guilty returned against Me. Magistrate Lingo Platter sent Me HOME to My Family as A Fuller Investigation Revealed ….. I was NOT Guilty of the False Charges against Me in the Information by the FBI there in Houston. I have PUBLISHED Much about these matters on the Net by Using this letter as the BASIS for the Request that My Arrest record of November 18th 1985 Be EXPUNGED. The Arrest was on a Flimsy as Flimsy can be INFORMATION 33 Years Ago and the MULTI TRILLIONS in Looting have since been EXPOSED. The Vast Crimes and Conspiracies associated with the Largest Financial Crimes in Human History are NO LONGER A SECRET. I have asked UPI to write a Follow Up On My Story. My November 18th 1985 Arrest and Hearings Before Magistrate Lingo Platter ….. THERE WAS A FAR FAR FAR Lager Background and Story ….. Much Like Edwin Wilson and that C4 Plastics that He had been provided by CIA ?? The Octopus ALSO involved Charlie Wilson’s War and Iran Contra and YES Many Texas based S&Ls and Banks. I am thinking the ENORMITY of the Houston Based Involvement with S&Ls and BANKS in connection with My Story is certainly RELEVANT and MITIGATING. I would Like The WHOLE Story of My False Arrest to CLEAR UP The Matters regarding THE FBI’s FALSE TALES ABOUT ME. Jokes: What is the difference between Colombian Drug Cartels and the Justice Departments? Brian, can you post the website address of this post? My system couldn’t handle the 94K file and run it properly but I could likely access it with my browser.